February was crazy man! Like… surf the waves with a blindfold on crazy! Alright, so here’s the scoop for what all has happened in February. Yea… that’s a touchy subject. It’s done! Like… really done. But we’re still trying to coordinate some aspects on the business side. Believe it or not, in the world of authorship today, some people don’t like it when you take matters into your own hands. Yet, I’m not one for watching the paint dry only to discover you put oil on the wall and not paint. Life is short, time is precious, and I have way more stories to tell. However, if you want a copy, skip on over to the TS Wieland Patreon and if you join as a $10 or more Patron, you’ll be sent an exclusive copy ASAP. It’s the story of one big time billionaire who thinks he has everything, only to take a bet from a friend and spend three days on the lower city streets and discover from a young woman how having nothing can mean more than having everything. The exclusive TS Wieland novella, Fated Adversary, is now available for Patreon supporters as well. I know, I know. But I can’t give everything away for free. If you haven’t read it yet, it’s an incredibly heart warming story about an old college professor who plays a game of chess verse and unknown opponent while in the hospital. Though, as he continues to play his game, he discovers the opponent he is facing might be more deadly than he thought, as each move of his game impacts the lives of the other people he’s made friends with on his floor. It’s so good in fact, there’s been many talks of converting it into a script and being made into an independent film with some folks I’ve met in Nashville. Nothings in stone of course, but it’s still worth checking out! As for the home front, not much has changed. The world keeps spinning, and I keep dreaming. I recently came across a fantastic series on Netflix titled Medal of Honor, which tells the stories of a few young men in US history worthy of the US highest military honor in a cinematic fashion. Guys that when they saw their friends in danger, love and courage took over. It’s a quality that I aspire to write into all of my books, preaching selflessness, open mindedness, and courage. A few aspects of my own life I try my hardest to live up to. If you don’t know me personally, I can tell you I have enormous respect for the military. Facing some of the worlds darkest times and overcoming fear is true heroism, and I admire that. I live no more than a stones throw from THEE United States Air Force Academy and have for all my life, so having heroes walking among the streets around you makes it hard to leave as a writer of courageous protagonists. BUT, I have been aspiring to move to the UK for sometime. Love the history, culture, and atmosphere. My life’s been needing a little adventure, so I can’t say I’ll be grounded here for very long. As much as I wish I could be like Ally and be dragged from my life into a grand adventure, blazing my own trail will have to do. Anyway, enough of the rambling. I know it’s grown stale reading the cheesy text images with flowers saying “Keep your head up!” on every social media platform, but those kinds of phrases are cheesy and cliche because they hold some serious truth. As I began to write Sem and Ally Adventures, I just wanted to go an adventure through all the wondrous worlds I read and learned about growing up. Worlds with pirates, chivalrous knights. revolutions for liberty, wars where peoples true colors came forward, and when the dust settled, the loving bonds created between people were all that remained. But what I discovered instead in writing the series, and continue to discover, is how it embodies the concept of how important we all are. How one life is important, as much as some of us might think it’s not. Without you, this world could not go on. If you disappeared, this world would being calling out for you endlessly with a broken heart, praying for a savior to find you and bring you home. So, take comfort in knowing you matter. And although I can’t say for certain there are two guardians out there watching over each and every world, I can say that if there are, they are people like those who have been awarded the medal of honor. Role models for courage, bravery, kindness, love, and selflessness. Heroes who represent the best qualities humanity has to offer. So, stay strong in the fight, be kind to whomever you meet, and just keep on fighting. You don’t earn medals fighting for yourself. You earn them fighting for those whom you care about and for causes bigger than yourself. By visiting and joining the Official TS Wieland Patreon page, you’ll be given early access to all the chapters of the book for the current month! AND you can even get a copy of the book itself shipped to your doorstep! That’s bananas! I know right? I just used the word bananas! I even bolded it too. Anyway, if you’ve grown to love Sem and Ally Adventures novel series, or you just love audio books or even audio drama’s, show your excitement by contributing as little as $2 a month in favor of more audio books. In return, you’ll gain exclusive access to a whole world of new and exciting content ranging from more short stories, more dramas, more books, more merchandise, more of everything! Once again, I’d like to thank all our current Patrons for being as awesome as they are, and a happy new year to you all! From Your Friend in the World Between Worlds! May is coming to a close, and along with that comes even more updates! Along with a new amazing website, a lot has happened over the past several days, including exciting news on Pursuit of Orlinia, and new developments in the world of Sem and Ally Adventures. First off, I would like to mention that Pursuit of Orlinia is finally through the first draft phase and has moved on to the shorter process of content editing. The next step involves checking both characters, dialogue, story, and so on for continuity from beginning to end. Once that is all said and done, next comes the process of proof editing, which always takes some time to make sure things are as perfect as they can be. Afterward, there will be a release of the book for those listed and registered to find any odds or loose ends, followed by more editing, and then the final and official public release scheduled later this fall. So, check back soon if you’d like to read the book before the public release and offer your feedback! Currently the release date is scheduled for September of this year, 2018. In the meantime, work has begun on organizing the final cover for the book along with a few minor character renditions and other illustrations by some of the worlds most talented artists. What is Pursuit of Orlinia about some of you might ask? It’s a romance adventure! A story of two people from opposite worlds, who not only change each others lives for the better, but the lives of those around them as well. It’s a modern fairy tale about love, greed, discovery, and adventure which will have you turning pages late into the night. So, if you’re a fan of true love, exciting adventures, and self discovery, I know you’ll enjoy this latest novel! The first draft for the next addition to the Sem and Ally adventure series, Ally: Guardian of Worlds, is already in full swing, with the first draft already 1/3 through completion with even more to come. Currently the release of the book is set for later this year (2018), with the public release set to be at the start of next year. Work has also begun on creating the newest Sem: Adventures Across Time audible edition, which we hope will be one of the best audible books ever! Plans for a fully based soundtrack and voice cast are in full swing, along with amazing narration. So, more news on this project will be on the way, so stay tuned! 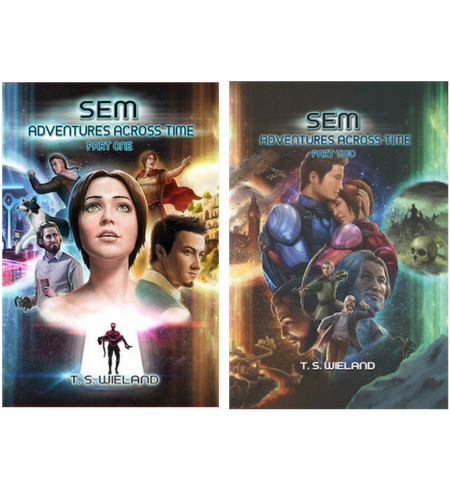 Several TS Wieland short stories will be added in the next upcoming months for FREE (100% Grade A, Guaranteed with No Strings Attached), so be sure to check back and fill that reader’s craving you can’t quite shake. That’s all that can be said for now, but be sure to check back next month for our June update. Have a lovely summer and keep letting your imagination run wild!